The paired domain is an approximately 126 amino acid DNA-binding domain, which is found in eukaryotic transcription regulatory proteins involved in embryogenesis. The domain was originally described as the 'paired box' in the Drosophila protein paired (prd) [(PUBMED:2877747), (PUBMED:3123319)]. The paired domain is generally located in the N-terminal part. An octapeptide [(PUBMED:10811620)] and/or a homeodomain can occur C-terminal to the paired domain, as well as a Pro-Ser-Thr-rich C terminus. Paired domain proteins can function as transcription repressors or activators. The paired domain contains three subdomains, which show functional differences in DNA-binding. The crystal structures of prd and Pax proteins show that the DNA-bound paired domain is bipartite, consisting of an N-terminal subdomain (PAI or NTD) and a C-terminal subdomain (RED or CTD), connected by a linker. PAI and RED each form a three-helical fold, with the most C-terminal helices comprising a helix-turn-helix (HTH) motif that binds the DNA major groove. In addition, the PAI subdomain encompasses an N-terminal beta-turn and beta-hairpin, also named 'wing', participating in DNA-binding. The linker can bind into the DNA minor groove. Different Pax proteins and their alternatively spliced isoforms use different (sub)domains for DNA-binding to mediate the specificity of sequence recognition [(PUBMED:11103953), (PUBMED:15148315)]. Drosophila paired (prd), a segmentation pair-rule class protein. Drosophila gooseberry proximal (gsb-p) and gooseberry distal (gsb-d), segmentation polarity class proteins. Drosophila Pox-meso and Pox-neuro proteins. Mammalian protein Pax1, which may play a role in the formation of segmented structures in the embryo. In mouse, mutations in Pax1 produce the undulated phenotype, characterised by vertebral malformations along the entire rostro-caudal axis. Mammalian protein Pax2, a probable transcription factor that may have a role in kidney cell differentiation. Mammalian protein Pax3. Pax3 is expressed during early neurogenesis. In Man, defects in Pax3 are the cause of Waardenburg's syndrome (WS), an autosomal dominant combination of deafness and pigmentary disturbance. 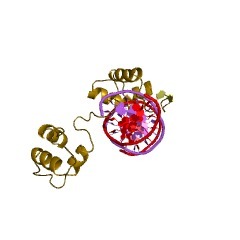 Mammalian protein Pax5, also known as B-cell specific transcription factor (BSAP). Pax5 is involved in the regulation of the CD19 gene. It plays an important role in B-cell differentiation as well as neural development and spermatogenesis. 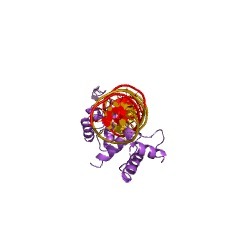 Mammalian protein Pax6 (oculorhombin). Pax6 is a transcription factor with important functions in eye and nasal development. In Man, defects in Pax6 are the cause of aniridia type II (AN2), an autosomal dominant disorder characterised by complete or partial absence of the iris. 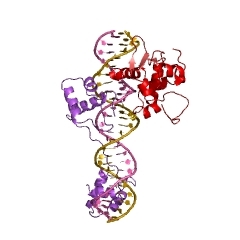 Mammalian protein Pax8, required in thyroid development. 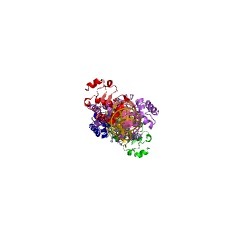 Mammalian protein Pax9. In man, defects in Pax9 cause oligodontia. Zebrafish proteins Pax[Zf-a] and Pax[Zf-b]. There are 7270 PAX domains in 7258 proteins in SMART's nrdb database. Taxonomic distribution of proteins containing PAX domain. This tree includes only several representative species. The complete taxonomic breakdown of all proteins with PAX domain is also avaliable. Click on the protein counts, or double click on taxonomic names to display all proteins containing PAX domain in the selected taxonomic class. PAX genes are developmental control genes that encode transcription factors containing a DNA-binding paired domain. Mutations in three of the nine mouse genes (Pax1, Pax3 and Pax6) and two of the nine human genes (PAX3 and PAX6) are known to cause developmental defects. These defects are caused by loss-of-function alleles; pathogenesis occurs as a result of a half dosage of the PAX gene product in particular cells. Gain-of-function mutations have been implicated in cancer. Conservation of a large protein domain in the segmentation gene paired and in functionally related genes of Drosophila. Extending our search for homologous domains of the Drosophila paired gene, two closely linked genes at the gooseberry locus have been isolated. Both genes are expressed with a single segment periodicity but with different spatial and temporal expression patterns. While the transcripts of one gene appear earlier and are equally distributed between ectoderm and mesoderm, those of the second gene accumulate preferentially in neuroblasts. The similarity of these expression patterns to the 14-band pattern of the paired gene suggests a functional relationship. Such a functional link may be reflected in the two structurally homologous domains shared with the paired gene: a new type of homeo box extended by 18 amino acids at the 5' end, and a new domain, the paired box, consisting of a sequence of 128-135 amino acids. Thus, together with the PRD repeat, the paired gene contains at least three different domains, each defining a gene set thought to be important for development. SwissProt sequences and OMIM curated human diseases associated with missense mutations within the PAX domain. This information is based on mapping of SMART genomic protein database to KEGG orthologous groups. Percentage points are related to the number of proteins with PAX domain which could be assigned to a KEGG orthologous group, and not all proteins containing PAX domain. Please note that proteins can be included in multiple pathways, ie. the numbers above will not always add up to 100%.